Sergio Pallottelli captivates and dazzles audiences world-wide. As a soloist and avid chamber musician, his performances take him to halls all over the world, from Europe to Australia, from the US to South America. Constantly in search of a new composition or a new piece to adapt for the flute, he offers elegant and passionate programming, always communicating with his audiences in the most charismatic way, be it in major orchestra halls or chamber settings alike. Mr. Pallottelli’s virtuosic and poetic style of playing has a very human approach to it and is always at the service of music, his sound being alive and multicolored, his phrasing always elegant yet daring. His interest in a wide variety of styles has allowed him to collaborate with composers world-wide, many pieces having been written for him. His love for chamber music has brought him to perform with top musicians from five continents. He regularly performs with pianist-composer John Orfe and pianist Douglas Ashcraft; with the latter, he recorded a compact disc of Italian Romantic Music for flute and piano in August 2006 on the Brioso Recordings CD label. With both pianists he has regular engagements in Central America, South America and Europe. Mr. Pallottelli is equally at home playing and teaching music from the Baroque to our time, as well as music of South and Central America. He is co-founder of a concert series with harpsichordist Britt Wheeler now in its second season, of music performed on modern flute and a 1928 Pleyel harpsichord. He has been the flutist with the Orchestra Sinfonica do Estado de Sao Paulo, Utah Philharmonia, Utah Chamber Artists, Waterbury Symphony, and Rotary International Orchestra. For four years he was a member of Canyonlands New Music Ensemble directed by Morris Rosenzweig in Salt Lake City, Utah. Mr. Pallottelli teaches master classes annually San Jose, Costa Rica and Monterchi, Italy as well as throughout the USA. In Italy he is maestro Ransom Wilson’s assistant in his yearly master class in Tuscany. The many festivals he has appeared at as a performer or teacher include Nice Summer Music Academy, France; Festival de Flautistas en la Mitad del Mundo, Ecuador; Festival Internacional de Flautistas, Peru; and Festival de Flautistas in San Jose, Costa Rica. He is in high demand worldwide, as a soloist, chamber musician and teacher. Sergio Pallottelli received his musical education at the Milan Conservatory, Italy, the University of Utah, and the Yale School of Music. His principal teacher and mentor was Ransom Wilson and he has studied with teachers such as Roberto Fabbriciani, Tara O’Connor and Susan Goodfellow. In addition, he had the privilege of working closely with one of the last French flute legends of his generation, Maxence Larrieu. 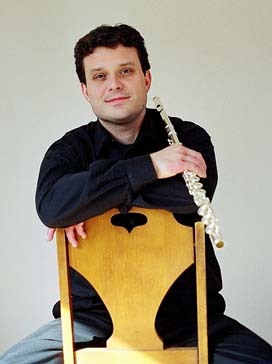 Mr. Pallottelli makes his home in New Haven, Connecticut where he maintains a private studio of advanced flutists, as well as being Professor of Flute at the University of Bridgeport and the Taft School.